The former Hockwell Ring fighter, who won his 10th professional bout by beating Konstantin Alexandrov a fortnight ago, will now go for his first belt on the Goodwin Boxing ‘Strike’ card. There has been bad blood brewing between the pair on social media as Udofia, 25, said: “He does not know what he is saying or what is going on. “His big mouth has just got him into a heap of trouble. “It is going to be easy work. Mark my words Jones will never get in a ring again after this fight and he will not want to. “This fight is going to be so easy. Jones, 24, is no easy opponent though, having won 11 and lost just one of his 12 bouts to date, that to Nicky Jenman in March 2017. 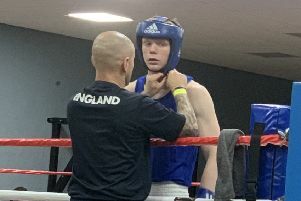 He won the Southern Area title by eating Matty Legg in March and defended it recently when he saw off Darren Codona at the Civic Hall, Grays in July. The fight is part of a massive card with the Joel McIntyre v Miles Shinkwin English title fight already headlining. There is also a light heavyweight Fight Cup semi-final between Darrel Church and Jordan Joseph supporting with more title fights to be added. To get tickets for the bout, head to www.goodwinboxing.co.uk.